NS1.bg Review 2019: Is NS1.bg a Good Hosting? With its Tier 3+ data center and excellent customer service, Bulgaria-based NS1 is one to beat when it comes to European web hosting. When it comes to web hosting, certain factors differentiate the newbies from the experienced companies. NS1 is a not a newbie. This pioneering Bulgarian hosting company was founded more than 15 years ago and has since advanced to become one of the leaders in the country’s cloud computing industry. Although located in Bulgaria, Ns1 also serves other parts of Europe, the Middle East, and Turkey. The NS1 website can be switched between the Bulgarian and English languages. NS1’s solutions are powered by the popular cPanel control panel with the Softaculous one-click installer for WordPress and 350+ other applications. 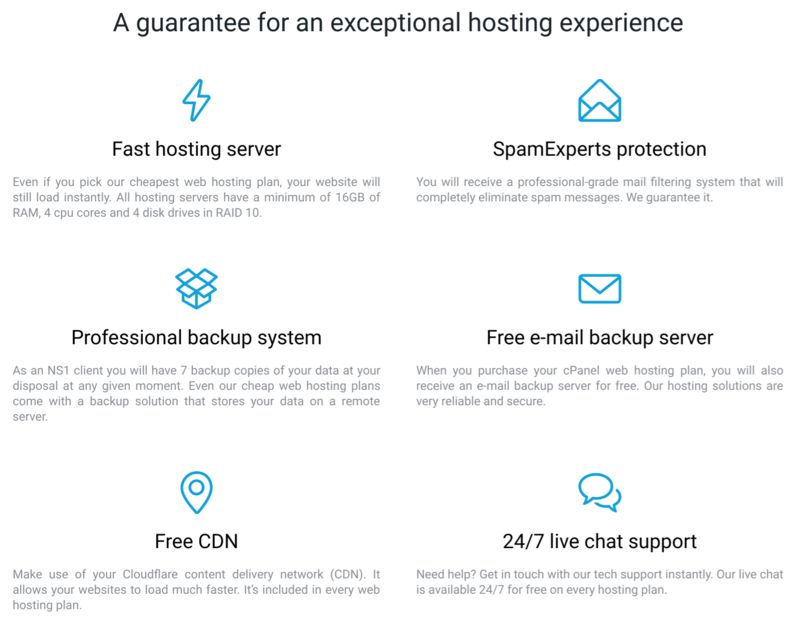 Even NS1’s cheap web hosting plans come with a backup solution that stores your data on a remote server, and you always have seven backup copies of your data at your disposal. Besides the shared hosting plans, you can instead opt for managed and unmanaged SSD cloud servers. Whatever hosting solution you choose, you benefit from a 99.9% uptime guarantee. NS1’s shared hosting plans come in four flavors – Euro, Standard, Business, and Plus – with all but the lowest plan providing unlimited web space and unlimited bandwidth. All plans except the lowest also offer price discounts of between 5% and 20% if you commit to at least six months’ worth of hosting (and up to 36 months). You needn’t worry too much about signing up for a long term because you get a 30-day money-back guarantee that should get you out if it all goes wrong within the first month. Every NS1 hosting plan gives you 24/7 live chat support for free. Because I couldn’t access this company’s FAQ page, I used the live chat to ask about additional support resources. 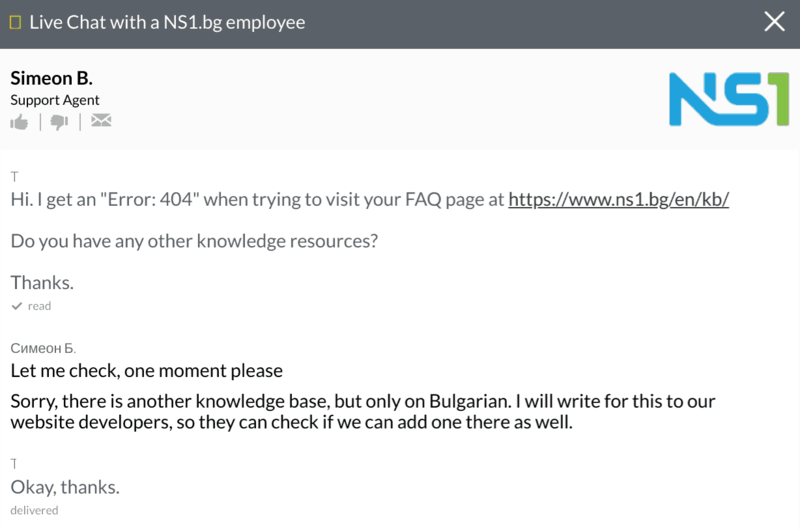 I’m pleased to say that an English-speaking agent answered my question immediately; if only to tell me that their more comprehensive knowledge base is only in Bulgarian. You can also summon support by submitting a ticket, and otherwise contact the company by telephone or email. NS1 is an above-average web hosting company. Its basic ‘Euro’ shared hosting plan is only suitable for personal websites, but every other plan offers many unlimited resources. For European web hosting, NS1.bg! could be the one for you. Wondering how NS1.bg stacks up against other Web Hosting companies? Enter any other Web Hosting company and we will give you a side-by-side comparison.